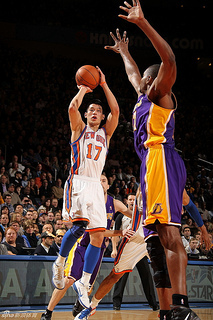 Jeremy Lin shoots in a game against the LA Lakers last year. 60 Minutes devoted a segment of its April 7th show to Jeremy Lin. Lin’s is a great story—born to Taiwanese parents in California, he graduated from Harvard and now plays basketball for the NBA’s Houston Rockets. The interview covers a range of topics, including culture, race, religion, and . . . prejudice. While Lin certainly contradicts some common Asian-American stereotypes, he seems to fit with others. In 2010, 49% of Asian Americans age 25 and older had a bachelor’s degree or more (compared to 28% of the overall US population). 50% identify as part of or lean toward the Democratic Party, while 28% identify or lean Republican. The largest religious affiliation for Asian Americans is Christian, at 42%. The next largest group is “Unaffiliated,” at 26%. While much of the information in the Pew report reflects well on Asian-Americans, some feel that the statistics can have negative consequences. it’s really important to understand that the community’s not a monolith and that we can’t use this information to think that it is the norm across all Asian-Americans because, historically, our communities have either been seen as model minorities or we’ve been put into the box of being disloyal, suspicious or we’ve been put into a box of foreigners who take away jobs. And the reality is that none of these stereotypes are true. Right? that Asian-Americans are evaluated not as individuals, but against the thousands of other ultra-achieving Asians who are stereotyped as boring academic robots. Some applicants refuse to mark any box in the race section, but some who are mixed race, have a choice of which box to check. My math scores aren’t high enough for the Asian box. I say it jokingly, but there is the underlying sentiment of, if I had emphasized myself as Asian, I would have (been expected to) excel more in stereotypically Asian-dominated subjects. Great thoughts here Craig! I think the biggest misconception is that “Asian” describes this group. Like you said, Chinese are different than Japanese and different from Indians. Yeah, one category doesn’t seem quite enough for 48 countries, with over 4 billion people. It’s so funny that they’re making such a big deal about emphasizing Jeremy Lin’s Asianness when in truth he’s probably not that much Asian at all. He’s just an American kid that looks Asian. Why can’t people get past that difference? Also, in reality the first “Asian” to make a big impact in basketball was actually Yao Ming. See instant otherness right away. Also, I hate pandering to the masses based on one’s ethnicity. It’s an insult to those who actually like the game and are actually trying to burst stereotypes. Me: why do you like Jeremy Lin? Random Asian dude: because he’s Asian. Thanks for the comment. Interesting points. Lin is a first-generation Asian-American (or second-generation, depending how you use the term), and he still seems to have some pretty strong family ties to Taiwan—and holding basketball camps there over the summer—so I can see why Taiwan/Asia would root for him. As for Yao Ming . . . so sorry to see his career end. « A Scholar, a Footballer, and a Tourist Walk into a Foreign Country . . .
You are currently reading Asian-American Stereotypes: “A Whole Different Issue” at Clearing Customs.